Cockroaches are one of the most commonly noted household pest insects. They feed on human and pet food, and can leave an offensive odor. They can also passively transport microbes on their body surfaces including those that are potentially dangerous to humans, particularly in environments such as hospitals. Cockroaches have been shown to be linked with allergic reactions in humans.One of the proteins that triggers allergic reactions has been identified as tropomyosin. These allergens have also been found to be linked with asthma. Some cockroaches have been known to live up to three months without food and a month without water. Frequently living outdoors, although preferring warm climates and considered "cold intolerant," they are resilient enough to survive occasional freezing temperatures. This makes them difficult to eradicate once they have infested an area. There are numerous parasites and predators of cockroaches, but few of them have proven to be highly effective for biological control of pest species. Wasps in the family Evaniidae are perhaps the most effective insect predators, as they attack the egg cases, and wasps in the family Ampulicidae are predators on adult and nymphal cockroaches (e.g., Ampulex compressa). The house centipede is probably the most effective control agent of cockroaches, though many homeowners find the centipedes themselves objectionable. Ampulex wasps sting the roach more than once and in a specific way. The first sting is directed at nerve ganglia in the cockroach's thorax; temporarily paralyzing the victim for 2–5 minutes, which is more than enough time for the wasp to deliver a second sting. The second sting is directed into a region of the cockroach's brain that controls the escape reflex, among other things.When the cockroach has recovered from the first sting, it makes no attempt to flee. The wasp clips the antennae with its mandibles and drinks some of the hemolymph before walking backwards and dragging the roach by its clipped antennae to a burrow, where an egg will be laid upon it. The wasp larva feeds on the subdued, living cockroach. 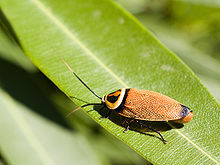 In Singapore and Malaysia, taxi drivers use Pandan leaves as a cockroach repellent in their vehicles.